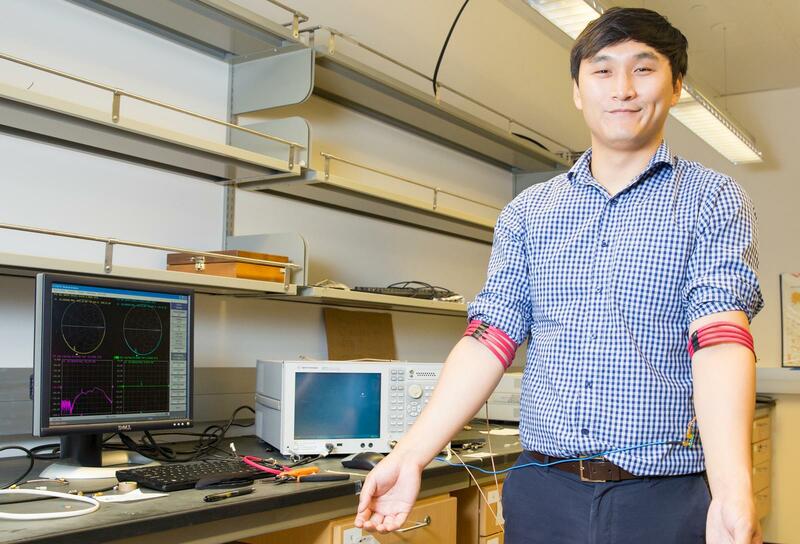 Jiwoong Park, an electrical engineering Ph.D. student and first author of the study, demonstrates communication from arm to arm using the magnetic field human body communication prototype developed in Mercier’s Energy-Efficient Microsystems Lab at UC San Diego. Electrical engineers at the University of California, San Diego demonstrated a new wireless communication technique that works by sending magnetic signals through the human body. The new technology could offer a lower power and more secure way to communicate information between wearable electronic devices, providing an improved alternative to existing wireless communication systems, researchers said. They presented their findings Aug. 26 at the 37th Annual International Conference of the IEEE Engineering in Medicine and Biology Society in Milan, Italy. “In the future, people are going to be wearing more electronics, such as smart watches, fitness trackers and health monitors. All of these devices will need to communicate information with each other. Currently, these devices transmit information using Bluetooth radios, which use a lot of power to communicate. We’re trying to find new ways to communicate information around the human body that use much less power,” said Patrick Mercier, a professor in the Department of Electrical and Computer Engineering at UC San Diego who led the study. Mercier also serves as the co-director of the UC San Diego Center for Wearable Sensors. In this study, electrical engineers demonstrated a technique called magnetic field human body communication, which uses the body as a vehicle to deliver magnetic energy between electronic devices. An advantage of this system is that magnetic fields are able to pass freely through biological tissues, so signals are communicated with much lower path losses and potentially, much lower power consumption. In their experiments, researchers demonstrated that the magnetic communication link works well on the body, but they did not test the technique’s power consumption. Researchers showed that the path losses associated with magnetic field human body communication are upwards of 10 million times lower than those associated with Bluetooth radios. Lower power consumption also leads to longer battery life. “A problem with wearable devices like smart watches is that they have short operating times because they are limited to using small batteries. With this magnetic field human body communication system, we hope to significantly reduce power consumption as well as how frequently users need to recharge their devices,” said Jiwoong Park, a Ph.D student in Mercier’s Energy-Efficient Microsystems Lab at the UC San Diego Jacobs School of Engineering and first author of the study. The researchers also pointed out that this technique does not pose any serious health risks. Since this technique is intended for applications in ultra low power communication systems, the transmitting power of the magnetic signals sent through the body is expected to be many times lower than that of MRI scanners and wireless implant devices. Another potential advantage of magnetic field human body communication is that it could offer more security than Bluetooth networks. Because Bluetooth radio communicates data over the air, anyone standing within 30 feet can potentially eavesdrop on that communication link. On the other hand, magnetic field human body communication employs the human body as a communication medium, making the communication link less vulnerable to eavesdropping. With this technique, researchers demonstrated that magnetic communication is strong on the body but dramatically decreases off the body. To put this in the context of a personal full-body wireless communication network, information would neither be radiated off the body nor be transmitted from one person to another. “Increased privacy is desirable when you’re using your wearable devices to transmit information about your health,” said Park. April 15, 2019 - Shaw Communications: Declining Wireless Revenue Not A Concern Seeking AlphaShaw Communications is a leading cable operator in Western Canada and currently the fourth largest wireless communication *service* provider in the country.